Overview - Peppino, the nickname of the boy at the story's heart, is a tough little kid in the 1930s, used to the rough-and-tumble world of Baaria (local slang for Tornatore's native Bagheria), a hot and dusty Sicilian village with one main street. His adventures are many and his memories singular: men gambling in the local square, goats eating his schoolbooks, and the enchantment of silent film screenings. All of this plays out against the darker canvas of black-shirted fascists strutting in the streets, the declaration of war and the ecstatic moment of liberation when the Allies land on the island. In his academy award winning film, 'Cinema Paradiso,' Italian director Giuseppe Tornatore created an achingly nostalgic rumination on growth, love, small town community, and the power of cinema itself. The setting of the movie was a character unto itself, just as important as any of the actors, and the director injected just as much personality into the small supporting roles as he did into the stars. For his 2009 effort, 'Baaria,' Tornatore returns to that same mold of filmmaking but takes it a step further, elaborating on many of the same themes, concepts, and even stylistic devices as his much celebrated classic. Replacing a passion for cinema with a sprawling political awakening, and placing even more emphasis on the protagonist's romance and the actual town itself, 'Baaria' is both heavily familiar and thankfully unique, weaving a lighthearted but powerful tale of family, shifting times, and community. A pure passion project and labor of love for the filmmaker, the movie features a palpably personal touch, but a bloated script, overambitious scope, and sometimes self-indulgent air, muddle otherwise simple themes and cause the story to lose some impact. Inspired by the director's own experiences growing up in Bagheria, Sicily, the script is a sweeping but intimate romance that tells the decades spanning story of Peppino Torrenuova (Francesco Scianna), starting with his childhood in the 1930s and continuing on into his old age. Emphasis is placed on his courtship of and subsequent marriage to the beautiful Mannina (Margareth Madè) as well as his gradual political rise within the communist party of Sicily. Fairly episodic in nature and featuring a loose treatment of time, Tornatore creates a mosaic of bullet points in the life of his protagonist, and jumps forward through the years frequently. Bolstering the romance and political narrative is an equal focus on the actual town of Bagheria itself, with small supporting characters coming and going throughout the narrative, helping to illuminate the film's deeper themes and enrich the story of its protagonist. Much like 'Cinema Paradiso,' Tornatore employs a fairly light and sentimental touch throughout the proceedings. Peppino's story is full of whimsical comedy, passion, and even a small dash of magic here and there. The various vignettes throughout his life present many entertaining and cheerful escapades about the hardships and joys of growth and love, and the fanciful eccentricities of his town and neighbors. It's not all mere fun and games, however, and the director does inject some genuine drama and even tragedy into the narrative. Peppino's professional and personal setbacks play a major role, and his shifting priorities and eventual realizations help to forge many of the movie's larger themes. There are several wonderful shots, gorgeous images, and intricate set pieces, but it’s the smaller moments that really hold the most lasting impact. A son who catches a glimpse of his father's sadness, two lovers in bed together beneath a leaky roof, a mother reading a letter from her husband to their children, and a family lying together across a cold, damp floor, desperate for relief from the unrelenting heat outside. Many of these scenes and scenarios are culled from Tornatore's actual life and memories, and that personal feeling adds a pervasive level of genuine heart to the picture. Unfortunately, while individual pieces work just fine, 'Baaria' never fully comes together, and its generation spanning story lacks cohesion and drive. Early scenes are particularly disjointed, as we jump between various eras rather quickly. The opening of the film actually introduces us to Peppino's eventual child before quickly flashing back to a young Peppino himself and then his father. While it's clear that Tornatore wants to set up an epic generational structure right off the bat, these early scenes are a little confusing and disconnected. Just as individual plot threads start to get interesting, we are suddenly thrust forward. The manner in which the director transitions throughout the decades and between the different actors playing the main characters, is stylistically interesting but a little hasty. Sometimes characters will transform into older versions of themselves within the same shot, with an object quickly obstructing their face or a momentary lean out of frame, and other times it will occur with a mere, straightforward cut. One minute Peppino is a teenager, and the next he's now a man. While the method in which this happens visually on screen is certainly unique, the shifts can be a little jarring and abrupt. There is a lot going on throughout the movie with Peppino's various political conflicts and personal plotlines, but the film simply tries to be too much all at once, and none of the individual threads are developed enough. Many of the various vignettes work well on their own, but they never really add to up a whole lot when placed together. We spend about two and a half hours with Peppino, but by the time the movie ends his story feels slightly unfulfilled and unsatisfying. Despite my criticisms about the film's bloated and unfocused narrative, Tornatore still manages to create an emotionally potent story. This is a film that is ultimately about family, and while the ending's foray into fantasy is slightly muddled and self-indulgent, the sentiments expressed remain powerful and moving. The emotions are all there, I just wish that more cohesion and development were present within the narrative to back it all up. In many ways, 'Baaria' can be seen as a companion piece to 'Cinema Paradiso' as the director elaborates on many of the same ideas. While 'Baaria' does successfully carve an identity of its own, it lacks precision and its various threads and concepts ultimately add up to very little. Still, Tornatore's labor of love is not without many admirable qualities, and its numerous beautiful moments do make for an interesting and worthwhile experience. 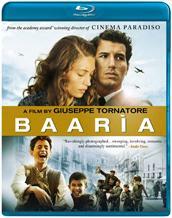 Image brings 'Baaria' to Blu-ray on a BD-25 disc housed in a standard case. After some warnings and logos the disc transitions to a standard menu. The packaging indicates that the release is region A compatible. The movie is provided with a 1080p/AVC transfer in the 1.78:1 aspect ratio. Though there are many positive aspects to the picture, there are a few problems that hold back the presentation. The original aspect ratio for the film appears to actually be 2.35:1 (according to IMDB). While it's possible that the director approved a 1.78:1 ratio for Blu-ray, there is no indication that this is the case, and thus this release does not seem to reflect the filmmaker's original intentions. With that said, the print itself is in good shape with no signs of damage, and a light layer of grain is present throughout. Detail is very strong, and many sequences exhibit a razor sharp, but perhaps slightly enhanced quality. Colors are vibrant and the many wide shots of Sicilian fields and villages sparkle with pop and dimension. Unfortunately, black levels are a bit elevated, and appear a few clicks too high causing some nighttime scenes to look a little faded. On the other end of the spectrum, whites are extremely intense giving daytime scenes a blown out and overexposed look. While this seems to be an intentional stylistic decision, the blooming often gives the picture a harsh quality. Though detail can be exceptional, colors are strong, and the cinematography itself is lovely, with the incorrect aspect ratio, and some elevated blacks this transfer unfortunately suffers from some issues. The audio is presented in an Italian DTS-HD MA 5.1 mix with hardcoded English subtitles. Full of energy and excitement this is a very lively and immersive track that features some excellent sound design. Dialogue is clean and full. Directionality across the full soundscape is strong, and the town which serves as the film's setting is almost always bustling with activity from all sides, creating an enveloping experience that actually adds character and personality to the visuals. Shouting voices, footsteps, rain, thunder, zooming planes, and even explosions all make their way across the rear speakers with distinct fidelity and strong range. Bass activity carries some punch in a few key scenes, most notably during a bombing in the town. Ennio Morricone's beautiful score sounds fantastic, and thankfully there is perfect harmony between the music, speech, and effects. In the included special features, the director talks at length about his emphasis on sound design, and this track really does demonstrate his skill and attention to detail. The mix does an exceptional job of complementing the visuals and offers an immersive aural experience. Image has included a solid assortment of special features including a commentary, a featurette, and some stills galleries. All of the extras are presented in standard definition with LPCM 2.0 audio and hardcoded English subtitles. Audio Commentary with Giuseppe Tornatore - Presented in Italian with English subtitles, the director provides an informative track. Tornatore focuses on discussing various obstacles faced while shooting, gives details on the casting process, locations used, sets constructed, and points out shots which feature digital enhancements. He also elaborates on some of the real life events and people that inspired many scenes. While the appeal of a subtitled commentary track might not be high, this is still a worthwhile listen, or I guess for those who can't speak Italian like myself, a worthwhile read. Backstage (SD, 30 min) - This is a behind-the-scenes look at the production with on-set interviews with cast and crew. Lots of footage is presented of the crew constructing the town seen in the film and the undertaking is very impressive to watch. We also get to hear from Ennio Morricone and even get a peek into the composer/director working relationship. Special Event (SD, 14 min) - Here we are treated to footage of the cast and crew during the Venice Film Festival, and other screenings and events. Interviews from a press conference are included and though brief, the participants offer a few worthwhile insights. A Conversation with Giuseppe Tornatore by Mario Sesti (SD, 26 min) - This is an in depth interview with Tornatore conducted during the film's sound mixing. The director provides lots of details on the mixing process and his own preferences for sound design. He also discusses his long lasting working relationship and friendship with Ennio Morricone. Deleted Scenes (SD, 2 min) - Four extremely brief and completely negligible scenes are included, viewable together with no chapter breaks. Photo Gallery (SD, 3 min) - A slideshow of photos from the film is presented with some of Morricone's music. Poster Gallery (SD, 1 min) - A slideshow of posters for the film is presented with some of Morricone's music. Theatrical Trailer (SD, 2 min) - The film's theatrical trailer is included in standard definition and while not anamorphic it does appear to be in the proper 2.35:1 aspect ratio. 'Baaria' is a sweet rumination on family, community, and love, but its sprawling narrative loses focus, resulting in an emotionally strong but ultimately disconnected and unsatisfying film. Though the video quality is solid, there are a few issues which hold back the presentation. On the other hand, audio is exceptional and supplements are informative. Though the movie is uneven and I'm hesitant to recommend any release with an incorrect aspect ratio, this disc is still worth a look.